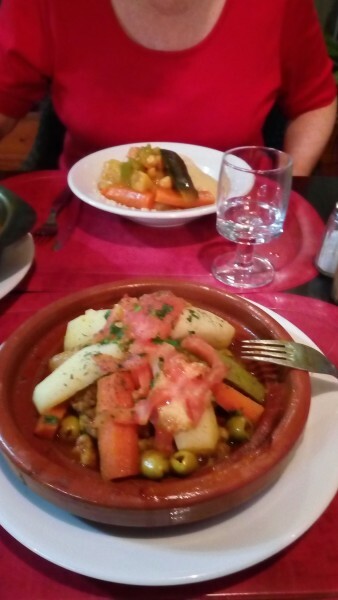 Tagine, couscous and ‘salads,’ as they call them in Morocco, are main features of the cuisine here, along with ‘pastilla,’ a pigeon pie. These dishes are often intriguingly spiced. Spices-cumin, cinnamon, ginger, turmeric, cilantro, saffron, paprika, cardamom, nutmeg, mace, anise and more- came from India in the old days, via camel, stopping in caravan serai, finding their way across North Africa and into the cooking utensils of millions of homes over the eons. My first exposure to the cuisine came in a small hotel across the street from our pretty fancy digs, the Diwanes hotel. Zaalouk is made with eggplant (aubergines), tomatoes, garlic, olive oil, cilantro, paprika, cumin, cayenne, olive oil and lemon. I was immediately won over. It is served with the local bread, which you find just about everywhere. 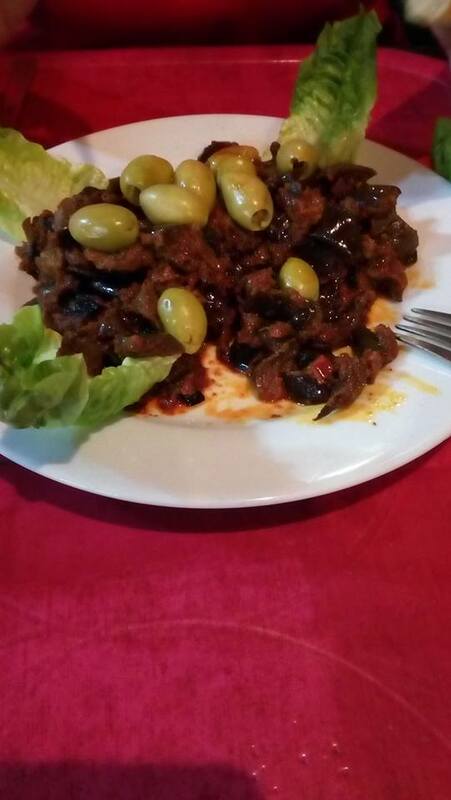 We also had a tagine at this meal and like the bread it too is ubiquitous. 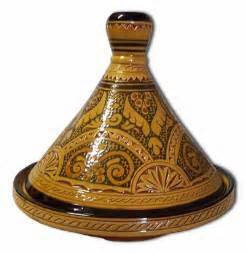 A tagine is a cooking vessel made from terracotta. Meat is on the bottom and, when included, vegetables are teepee’d above, then the vessel is placed in an oven and brought piping hot to your table. Some versions have no vegetables but cooked with prune or perhaps a dried apricot instead. In restaurants the beef is cooked beforehand as it is everywhere super tender. This can only be accomplished by slow cooking, but in a restaurant they bring tagines out in about 20 minutes. I had one tagine in a very fancy place where the chicken was hard as a brick but otherwise they have all been very good but very much the same regardless of price. Fancy places have better and more ‘salads’ and better surroundings. With very few exceptions fancy restaurants serve no alcohol like the cheaper places. It’s soft drinks, water, lemonade and everywhere there is mint tea made with fresh mint leaves stuff into the glass. Aside from Zaalouk I ran across two other outstanding items, both in inexpensive places. At Bab r’Cif there’s a place facing the gate. 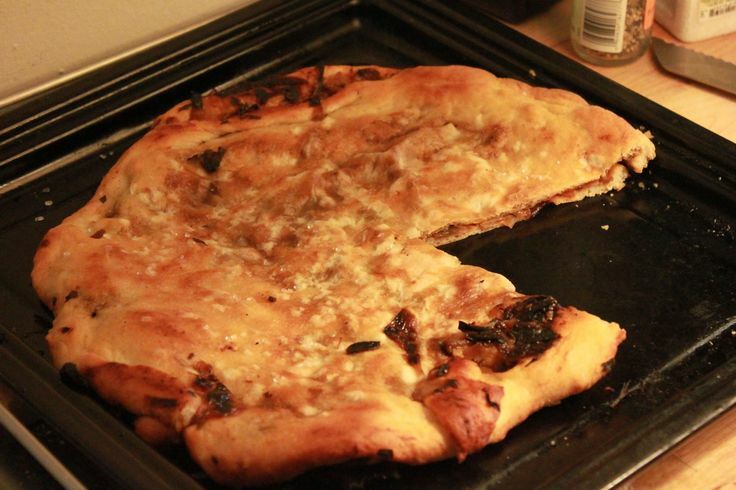 They have a flat bread that is spiced and interlaced with some cheese. We have seen a flat bread cooked on the grill. Here’s the recipe: https://www.thespruce.com/msemen-moroccan-pancakes-rghaif-2394812 In the fancier place we stayed in for breakfast you could have this bread grilled as you wait, along with white beans, grilled red, yellow and green peppers, cucumbers, olives, tomatoes fresh and grilled, fruit, juice – orange juice is everywhere and is excellent- as well as fried eggs. Couscous is a Berber dish of steamed semolina. Traditionally the couscous is made by hand by combining wheat flour and water, and rubbing the mixture between your hands until the small balls fall out. The mixture has to be fairly dry. It is usually served as a stew, which would include either beef, lamb, kefta (meatballs), or chicken as well as vegetables- carrots, potatoes, tomatoes, zucchini. It is generally mild with a thin but flavorful sauce. You can ask for harissa, a hot sauce. The ones at restaurants vary in flavor from one to the next. The ‘salads,’ which in Spanish would be called ‘tapas’ and in the US might be called simply vegetable side dishes or something like that, are outstanding and complex offerings or, in less expensive restaurants, simple affairs over which you might pour a white yogurt dressing. But when prepped more elaborately the spices can really bring you flavors that as a westerner you have never experienced and will most likely enjoy greatly. After a week of tagines and couscous I am ready to move on- they are much the same no matter where you go. These are referred to as ‘salads.’ But they are in many cases much more than just a salad- fabulously spiced! In a place called Le Table Bio- the French influence on the language here is unmistakable – I had the most fabulous kepab ever. It was a chicken version. I have no idea how they spiced it but here’s to them. And it was just $2.50. 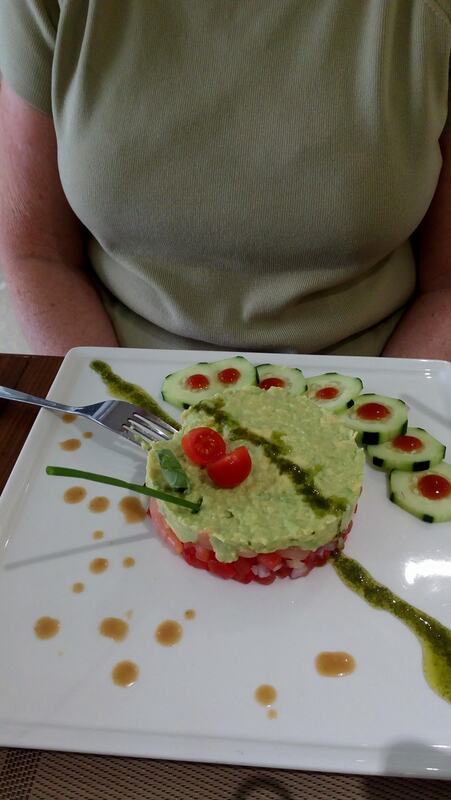 Peg’s avocado/shrimp salad was beautifully presented. 139 Blvd. Mohamed Zerktouni, Marrakesh. There are definitely epicurean reasons to visit this ancient land. And visitors need not spend a fortune. The most we have paid for a meal is $40 for two. Wine is expensive, but only by comparison with the rest of the offerings. 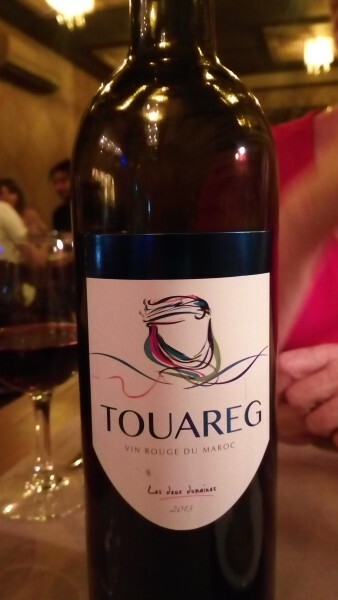 In our fancy hotel we paid $14 for a mediocre bottle, and twice that for a better offering. 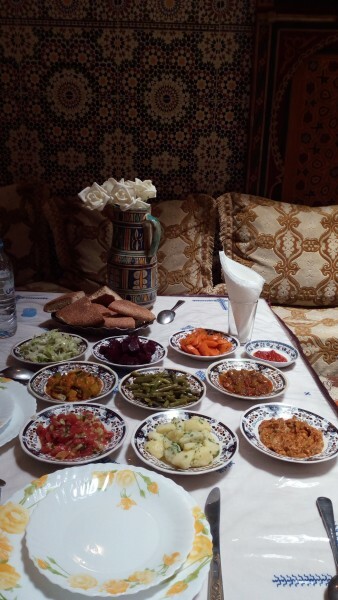 If you tire of traditional Moroccan food – after a week we did – then there are pizzas, pasta, panini, hamburgers, and more from the West. I even saw an Indian restaurant.